I have sculpted, in one medium or another, for most of my life. Having returned to my first love, clay, I have been making figurative pieces since 2007. My figurative work is informed by ideas and reflections upon the nature of childhood, play, half-remembered folk tales – and how these things impact upon us as adults. Sometimes light-hearted, sometimes unsettling or melancholy, my aim is to capture character and a suggestion of private thoughts, which can be interpreted in many ways. I try to imbue my figures with a sense of stillness at their core; in an uncertain world, they, at least, have a sense of themselves and of their destiny. I am fascinated by the tension in design between singularity and repetition. 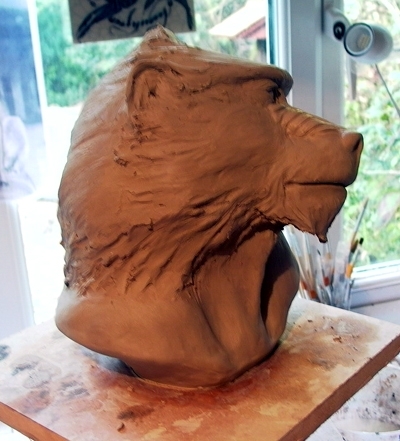 I will often sculpt a master in non-ceramic materials, from which I make plaster press moulds. The cast or pressed ceramic pieces that result from this process are then manipulated and modified with added hand-built elements to create unique works which, nonetheless, share a common origin. The process is similar to that of print making, in that one original design can be reproduced many times, with each copy having the ability to be subtly changed, depending on the amount of artist intervention. Movement is the key to my animal sculptures. I do not try to capture an exact likeness of a creature but rather something of it’s spirit and wildness. I work quickly and intuitively, handling the clay as little as possible to keep the surface ‘fresh’. Using hollow-building techniques I push the clay out from the inside to create a suggestion of muscle and bone. I also sculpt in wax in order to cast limited editions in bronze and cold cast media.